Hello! My husband and I just bought our first house. In the master suite, there is no door separating the master bath from the bedroom, which is a problem for noise, light, and privacy reasons. Apparently that is how "modern" homes in California homes are being built these days. We need to install some type of door there, but are not sure what good options there are to be had at a reasonable price (a few hundred dollars). We want the doors to look clean and finished and block out light and some noise at a minimum. The border of the opening is thicker than the wall and is bullnosed. Perhaps some tall and narrow french doors would be nice, but our initial thought is that they would need to be a custom size and potentially expensive. What type of labor and cost might we expect for a project like this? Other ideas? Thoughts or advice are very appreciated here. We are newbies to home ownership and improvement. Hello duqueclan, congratulation on your purchase of your first, and welcome to the community! I can understand the want for a door to separate the bedroom from the bathroom, especially on those days where one person may sleep in and doesn't want the noise & light coming from the bathroom. There are many door styles to choose from, have you decided to either paint the door or stain it? I've included some pictures below of Jeld-Wen doors, and I have also included some links to several brochures showing real wood doors and moulded doors. A moulded door is a door that has the panels embossed into the surface, these doors are available in either hollow or solid, for your application I would recommend a solid since you mention you wanted a block the noise emanating from the bathroom. A solid core construction door or as Jeld-Wen calls it "ProCore", is available on all Moulded & Flush doors--the solid core reduces the transmission of sound up 50 percent compared to a hollow core door, and the solid core helps prevent dents and dings. One other benefit of a Moulded door, once you have the door painted on all six sides, the door will no longer need to be "touched-up" compared to Stile and Rail doors. When you have a traditional wood door that is assembled, not stamped or embossed, those panels over time will shrink & move, which will reveal a unfinished area needing a "touch-up" to seal the door from moisture. None of this pertains to you if you have already decided to stain your doors. Below is overhead view of what a door jamb looks like. I don't see any casing in the picture you provided on your current wall opening, probably because there is no door frame there. 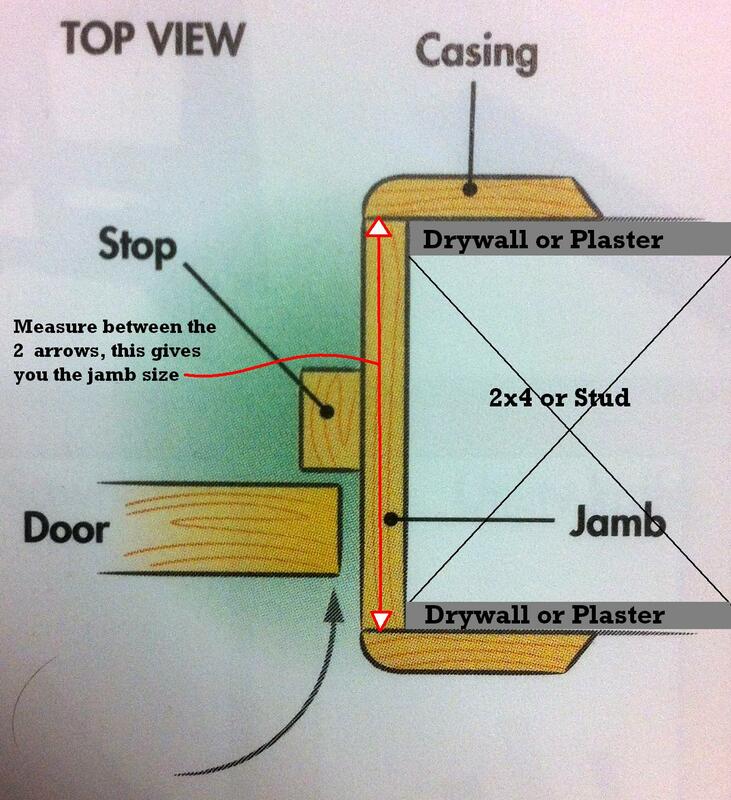 You just need to measure between the 2 arrows as illustrated in the photo below, and that will be your jamb size. Also, make sure there is adequate ventilation. A bath fan or an openable window will be required if you try to sell this house. Thanks so much for your thoughtful and detailed response. The brochures were a great start for us to get familiar with what's out there. Sounds like a solid core moulded door would suit our needs well. I'm still not clear on whether we would need a custom door or what could be done to accommodate a standard door. We will plan on speaking to an associate at the store, but your thoughts here would be appreciated. I noticed that some of the standard door sizes offered by Jeld-Wen come pretty close to the width and height of our opening (W: 2' 9.5", H: 7' 11.3", Thickness: 11.5"). There are doors that are 8' 0" or 7' 0" tall and 2' 8" or 2' 10" wide, and also narrow doors of the same heights and width of 1' 4" or 1'6". Taking the 2' 10" x 8' 0" door, would it be feasible to try to cut the door(s) down the fraction of an inch smaller in each dimension? What about taking the next smaller door, 2' 8" x 7' 0" and modify the opening to make it flush? If so, what are common ways of modifying the opening to accommodate a slightly smaller door? Since there is no casing on our opening, I suppose our jamb thickness is 11.5". It is much thicker than the standard thickness as your described. It is important that the door looks nice, and like it was intended to be there (not like we stuck in a door after-the-fact, hopefully). We do not want it to be an eyesore or potential negative point for buyers when we sell the property down the line. Thanks. We do have a fan as well as a window that can be opened in the bathroom, so we should be good here. Hello Jennifer, thanks for writing back. Your existing opening is 33-1/2"W x 95-3/8"H, existing opening is normally referred called "rough opening" which is normally measured between the studs or 2x4's, which you don't have visible. An existing opening of 33-1/2"W x 95-3/8"H would give you a door size of 31" x 92-7/8", this size is not standard—when I say door size I am referring to the door itself no frame. In either of the first two options, you will still need a custom size door because of the excessive large 11.5” jamb. Also, you will need to re-trim & do some drywall work to complete the job. If possible, could you please post a picture of the jamb. · Is the wall load-bearing? · Are there any pipes in the wall that may interfere with the pocket door track & frame? · Is there any electrical that needs moving, if so, can it be moved? Since you were so helpful with the previous users post, I thought I would reach out to you and ask your advice. We just bought a new house and the master bathroom has a similar layout as it is open to the master bedroom with no door. We do not like this and want to close it in with a door. As you will see, there is also a small knockout that will have to be closed in as well. The light switch may need to be moved or relocated. I have tried to attached a picture for your reference but it is not letting me for some reason. Maybe there is another way to get you a picture. Any help you can offer is greatly appreciated! Google sliding barn door. I have a master with a 4' gap between bedroom and vanity. I think I might try it. Google sliding barn door. I have a master with a 4&#39; gap between bedroom and vanity. I think I might try it.